852551 Magnet Set Darth Maul 2009 is a magnet set containing Anakin Skywalker in his young form, a Naboo Fighter Pilot and Darth Maul. This is a description taken from LEGO.com. Please do not modify it. Relive the excitement of Star Wars™ Episode I—on your fridge! Straight from Episode I The Phantom Menace, young Anakin Skywalker, a Naboo Fighter Pilot and the evil Darth Maul battle for the fate of the Republic and the galaxy on your fridge or other metal surfaces. Magnet set includes 3 authentic LEGO Star Wars minifigures with accessories! Facts about "852551 Magnet Set Darth Maul 2009"
Relive the excitement of Star Wars™ Episode I—on your fridge! Straight from Episode I The Phantom Menace, young Anakin Skywalker, a Naboo Fighter Pilot and the evil Darth Maul battle for the fate of the Republic and the galaxy on your fridge or other metal surfaces. 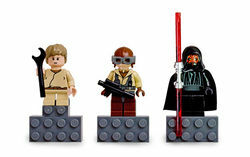 Magnet set includes 3 authentic LEGO Star Wars minifigures with accessories!